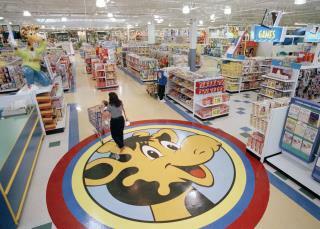 (Newser) – With the closing of all US Toys 'R' Us stores, mascot Geoffrey is headed for the unemployment line. But not so fast: The San Antonio Zoo wants the defunct toy chain to shift its famous giraffe to a new gig, that of conservation ambassador for, well, giraffes. As CNN reports, the zoo wants Toys 'R' Us to donate the rights to Geoffrey so that he can use his celebrity to preserve the fewer than 100,000 of his flesh-and-blood brethren left on the planet. "the zoo writes in a GoFundMe seeking to raise $100,000. It has a ways to go: It's at about $1,300 as of this writing." No worries..I'm sure all those snowflakes crying over the girl who's picture was posted posing with a giraffe she shot on safari will empty their pockets for this cause. Do they really want the mascot of a failed company to be the symbol of their efforts to save giraffes?